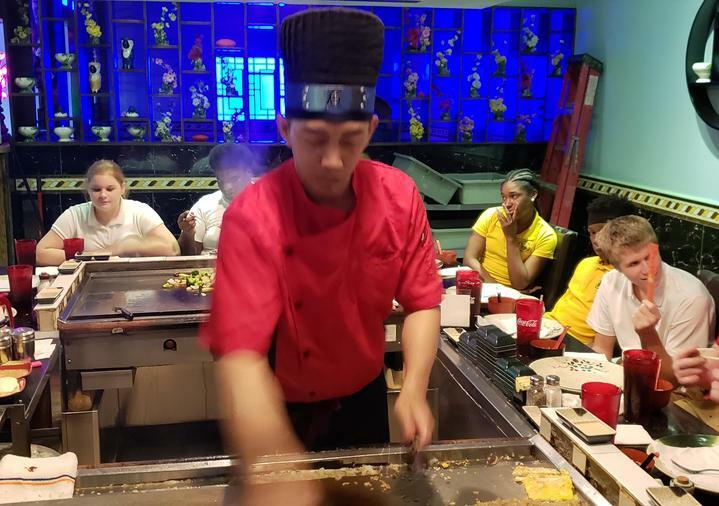 Concordia Education Center - Students with good behavior were eligible to participate in a field trip to Little Tokyo to have a hibachi lunch. 5th Grade Sidney A Murray Hydroelectric Citizenship Award Winners (left to right): Ava Augustine (MHS), Lyric Warner (VUE), Jalexia Watson (FUE), Kace Betts (CPA). Concordia Parish juniors and seniors attended College & Career Day on September 21, 2018. Twenty five area colleges and universities were represented. Coaches from Southern University recently stopped by Ferriday High School to visit students. Miss-Lou Veterans honor Vidalia Upper Elementary with new flags and inspiring words. Monterey High School - Mr Jamie Taunton's 1st grade reading class reached the 200 book mark of books read aloud since the beginning of the school year. This does not include the books the students have read in class or at home. What a great accomplishment! The Vidalia High School Student Council recently toured ULM and its Natural Science Museum. 2018-2019 Concordia Parish School Board Student of the Year Winners: Left to Right: Stevie Anderson (8th grade, VJH); Mallory Barlow (12th grade, MHS); Michael Anders (5th grade, CPA). Congrats winners! Vidalia Jr High - Students in Ms Allen's 6th grade science class had fun solving clues in the "Science Escape Room." 4th Grade Sidney A Murray Hydroelectric Citizenship Award Winners (left to right): Zakee Muhammad (FUE), Trinity Davis (VUE), Woodrow Wade (MHS), Payton Roth (CPA). Ferriday High JAG students enjoy a fun and informative tour of the Louisiana State Capitol hosted by State Representative Andy Anders. Vidalia High - The Viking Raiders recently took a field trip to Baton Rouge to visit the Capitol building. Representative Andy Anders provided certificates and lapel pins for the students to commemorate their trip. Vidalia Jr High - "Walking in the shoes of a student" - Parents and students at VJH participated in an Escape Room challenge. Monterey High School cheerleaders placed 2nd at the 2019 NCA High School Cheerleading National Championship. Congrats, girls! CPSB employees recently participated in NCCER Jumpstart training in Lockport, LA. Vidalia High - The Viking Raiders recently toured the USS Kidd and Museum in Baton Rouge. Vidalia Jr High - Students that scored Mastery or Above in Math and ELA on last year's state exam were rewarded with a trip to Area 51. Vidalia Jr High JAG students take a tour of the LSU campus. PreK Roundup will be Thursday, April 18, 2018. Click for details. 2018-2019 Concordia Parish seniors are required to complete the FAFSA in order to graduate. Click for details. The Parent Portal is now open! The Parent Portal is a great way to monitor your child's grades/attendance/discipline. If you don't have an account, you can create one today. Click the link located under the Parents menu. On September 19, we will be switching over to a new Internet web filter. Click for more details. Click the link to find out how to access your Google email account.